It still amazes me to hear my name aligned with “making history.” Truthfully, I never set out to accomplish anything historic. My only goal was to pursue my love of sport, and that sport happened to be football. What has separated me is that I didn’t set any limits on where football could take me. I loved it; the competition, the camaraderie, the challenge of a group coming together to achieve a single goal. This is what I enjoyed, and I pushed myself to be a part of this experience in any way I could. And that is my message to all young women. We need to remove the ceiling society has set in place and know that we have the capacity to do anything we will. And what’s important about my journey is not the fact that I was the first to infiltrate the “boys club” that was the NFL. It’s about knowing that your opportunities as young women are not narrowed because of your gender. And if anyone tells you different, I have already proved that they are wrong. I enjoy sports, and I of course love football. But I am no different than any of you reading this who have passions of your own. I’ve simply removed any barrier trying to prevent me from taking the next step. And my journey hasn’t stopped yet, hopefully yours hasn’t either. 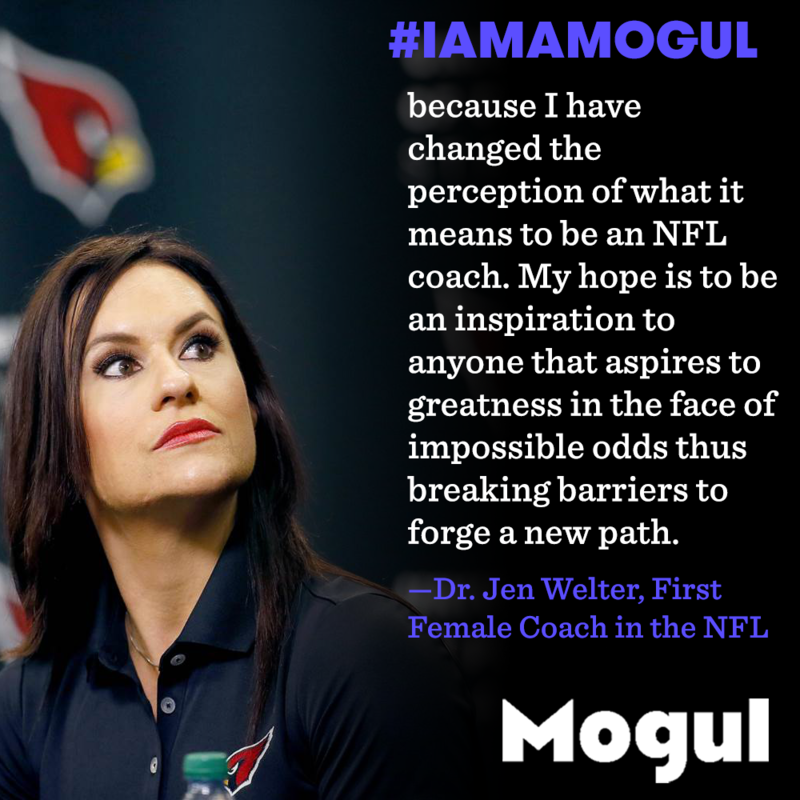 Be sure to check out Dr. Jen Welter's site Jenny Football for more inspirational advice. This is truly inspiring Dr. Jen Welter! Thank you for sharing your story with us!! You are a hero, Dr. Welter! This message will inspire women around the world so thank you so much again for posting such a vital message. Such an inspiring story. Women in sports has definitely gotten better but we are a long way from the time where women's games have the same interest as men's sports. Jen, you are a true example of the vision. Go, Dr. Welter! When did you start having an interest in football? Was there a certain moment? Very Inspiring! I am currently a sport management major wanting to pursue a career in the NFL! I would love to connect with you and talk about your experiences! smb1129 and 27 others upvoted this.